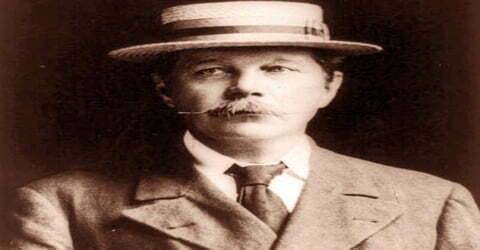 Sir Arthur Conan Doyle – British writer. 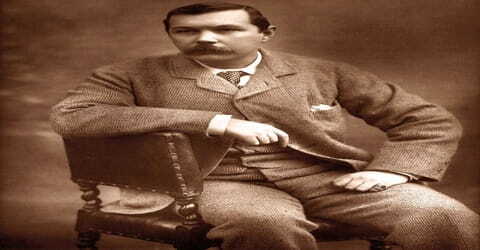 A renowned English author, Sir Arthur Conan Doyle was born on 22 May 1859 at 11 Picardy Place, Edinburgh, Scotland. He is best remembered as the creator of the famous detective Sherlock Holmes. Originally a physician, in 1887 he published A Study in Scarlet, the first of four novels about Holmes and Dr. Watson. In addition, Doyle wrote over fifty short stories featuring the famous detective. The Sherlock Holmes stories are generally considered milestones in the field of crime fiction. Born into a wealthy family in Edinburgh, Scotland, Doyle grew up listening to many enchanting tales narrated to him by his mother, Mary, a well-read and masterful storyteller. He initially went to medical school and after he graduated he was briefly employed and later set up his own practice. Unfortunately, his medical career did not succeed and he began writing stories while he waited for patients, little knowing the fact that these stories would change his life forever. He was a prolific writer; his non-Sherlockian works include fantasy and science fiction stories about Professor Challenger and humorous stories about the Napoleonic soldier Brigadier Gerard, as well as plays, romances, poetry, non-fiction, and historical novels. One of Doyle’s early short stories, “J. Habakuk Jephson’s Statement”, helped to popularise the mystery of the Mary Celeste. Doyle authored more than 60 ‘Sherlock Holmes’ mystery stories, which captivated readers and transported them into a world of mystery. Some of his notable ‘Sherlock Holmes’ works include, ‘Stories of Sherlock Holmes’, ‘The Adventures of Sherlock Holmes’, ‘The Hound of the Baskervilles’, ‘The Case-Book of Sherlock Holmes’ and ‘The Memoirs of Sherlock Holmes’. He also authored many non-fiction books, works of fantasy, science-fiction and wrote poetry. He has also published many historical novels. He created another fictional character named, ‘Professor Challenger’ and wrote a series of novels based on him. 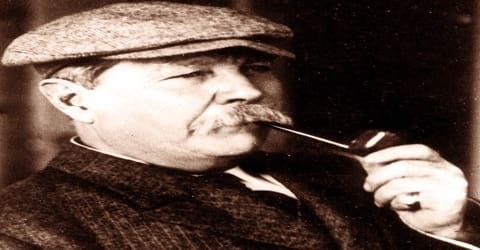 Arthur Conan Doyle, in full Sir Arthur Ignatius Conan Doyle, was born in Edinburgh, Scotland, on May 22, 1859, into an Irish Roman Catholic family of noted artistic achievement. His father, Charles Altamont Doyle, was born in England, of Irish Catholic descent, and his mother, Mary (née Foley), was Irish Catholic. In 1864 the family dispersed because of Charles’s growing alcoholism, and the children were temporarily housed across Edinburgh. In 1867, the family came together again and lived in squalid tenement flats at 3 Sciennes Place. Doyle’s father died in 1893, in the Crichton Royal, Dumfries, after many years of psychiatric illness. As a boy, Arthur was educated at a Catholic preparatory school. After attending Stonyhurst College, he entered Edinburgh University as a medical student in 1876 and received a doctor of medicine degree in 1885, upon completing his thesis, “An Essay upon the Vasomotor Changes in Tabes Dorsalis.” His family decided that he would spend a year there with the objective of perfecting his German and broadening his academic horizons. He later rejected the Catholic faith and became an agnostic. A source attributed his drift from religion to science and reason to the time spent in the less strict Austrian school. He also later became a spiritualist mystic. 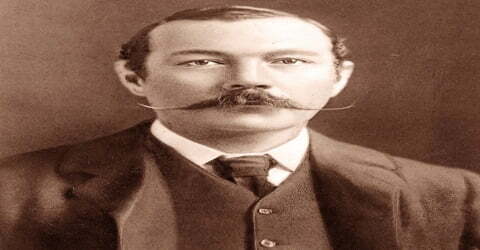 Doyle is often referred to as Sir Arthur Conan Doyle or simply Conan Doyle (implying that “Conan” is part of a compound surname as opposed to his given middle name). His baptism entry in the register of St Mary’s Cathedral, Edinburgh, gives “Arthur Ignatius Conan” as his given names and “Doyle” as his surname. It also names Michael Conan as his godfather. The cataloguers of the British Library and the Library of Congress treat “Doyle” alone as his surname. In 1885 Doyle married Louisa (sometimes called “Touie”) Hawkins (10 April 1857 – 4 July 1906). She was the youngest daughter of J. Hawkins, of Minsterworth, Gloucestershire, and the sister of one of Doyle’s patients. Louisa suffered from tuberculosis. They had two children. 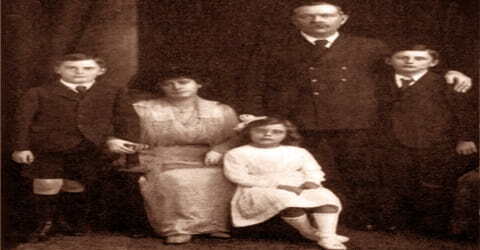 In 1907 he married Jean Elizabeth Leckie (14 March 1874 – 27 June 1940), whom he had first met and fallen in love within 1897. They had three children. He had maintained a platonic relationship with Jean while his first wife was still alive, out of loyalty to her. Jean died in London. Doyle suffered from Angina Pectoris. He supported Christian Spiritualism and became a part of the Spiritualists’ National Union. He was a member of ‘The Ghost Club’, an organization that believed in the supernatural. He played football and golf for clubs. He also played cricket for the Marylebone Cricket Club. While studying, Doyle began writing short stories. His earliest extant fiction, “The Haunted Grange of Goresthorpe”, was unsuccessfully submitted to Blackwood’s Magazine. His first published piece, “The Mystery of Sasassa Valley”, a story set in South Africa, was printed in Chambers’s Edinburgh Journal on 6 September 1879. On 20 September 1879, he published his first academic article, “Gelsemium as a Poison” in the British Medical Journal, a study which The Daily Telegraph regarded as potentially useful in a 21st-century murder investigation. While a medical student, Conan Doyle was deeply impressed by the skill of his professor, Dr. Joseph Bell, in observing the most minute detail regarding a patient’s condition. This master of diagnostic deduction became the model for Conan Doyle’s literary creation, Sherlock Holmes, who first appeared in A Study in Scarlet, a novel-length story published in Beeton’s Christmas Annual of 1887. After two long sea voyages as a ship’s doctor, Doyle practiced medicine at Southsea, England, from 1882 to 1890. In March 1891 Doyle moved his young family to London, where he began to specialize in ophthalmology (the area of medicine involving the eye). His practice remained small, however, and since one of his anonymous stories, “Habakuk Jephson’s Statement,” had enjoyed considerable success when it appeared in the Cornhill Magazine in 1884, he began to dedicate himself seriously to writing. In 1887, his piece ‘A Study in Scarlet’ was first published in the Beeton’s Christmas Annual. The piece received good reviews and first introduced the characters, ‘Sherlock Holmes’ and ‘Dr. John Watson’. Doyle struggled to find a publisher for his work. His first work featuring Sherlock Holmes and Dr. Watson, A Study in Scarlet, was taken by Ward Lock & Co on 20 November 1886, giving Doyle £25 (£2500 today) for all rights to the story. The piece appeared one year later in the Beeton’s Christmas Annual and received good reviews in The Scotsman and the Glasgow Herald. In 1888, ‘A Study in Scarlet’ was published in book form. This was one of the first novels of that time to use the magnifying glass as an investigative tool. The following year, his historical novel, ‘Micah Clarke’ was published. Doyle’s first novel, A Study in Scarlet, introduced Sherlock Holmes to the reading public. This was followed by two historical novels, Micah Clarke in 1889 and The White Company in 1891. The success of these works led Doyle to abandon medicine and launch his career as a writer. In 1889, his novel ‘The Mystery of Cloomber’ was published while the year 1890 saw the publication of ‘The Firm of Girdlestone’, which was later made into a silent film of the same name. The second Sherlock Holmes novel, The Sign of the Four (1890), was followed by the Holmes short story, “A Scandal in Bohemia” (1891). The popularity of these tales made others like them a regular monthly feature of the Strand Magazine, and the Adventures of Sherlock Holmes series was begun. Doyle eventually tired of these stories, and in “The Final Problem,” published in December 1893, plunged Holmes and his enemy, Moriarty, to their apparent deaths in the falls of Reichenbach. Nine years later, however, he published a third Sherlock Holmes novel, The Hound of the Baskervilles, but dated the adventure before Holmes’s “death.” Then, in October 1903, Holmes achieved his mysterious comeback from death in “The Empty House” and thereafter appeared occasionally until 1927. Other aspects of Conan Doyle’s medical education and experiences appear in his semiautobiographical novels, The Firm of Girdlestone (1890) and The Stark Munro Letters (1895), and in the collection of medical short stories Round the Red Lamp (1894). Conan Doyle’s creation of the logical, cold, calculating Holmes, the “world’s first and only consulting detective,” sharply contrasted with the paranormal beliefs Conan Doyle addressed in a short novel of this period, The Mystery of Cloomber (1889). 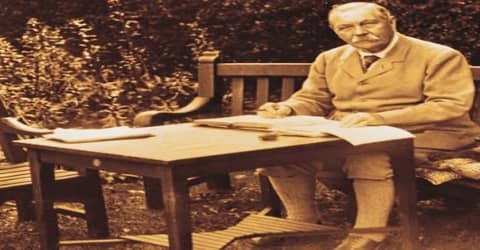 Conan Doyle’s early interest in both scientifically supportable evidence and certain paranormal phenomena exemplified the complex diametrically opposing beliefs he struggled with throughout his life. Doyle’s attitude towards his most famous creation was ambivalent. In November 1891 he wrote to his mother: “I think of slaying Holmes, … and winding him up for good and all. He takes my mind from better things.” His mother responded, “You won’t! You can’t! You mustn’t!” In an attempt to deflect publishers’ demands for more Holmes stories, he raised his price to a level intended to discourage them but found they were willing to pay even the large sums he asked. As a result, he became one of the best-paid authors of his time. In 1893, along with J. M. Barrie, he co-authored the comic opera, ‘Jane Annie, or The Good Conduct Prize’. The same year, it opened at the Savoy Theatre in London. In 1903, Doyle published his first Holmes short story in ten years, “The Adventure of the Empty House”, in which it was explained that only Moriarty had fallen, but since Holmes had other dangerous enemies especially Colonel Sebastian Moran he had arranged to also be perceived as dead. Holmes was ultimately featured in a total of 56 short stories the last published in 1927 and four novels by Doyle and has since appeared in many novels and stories by other authors. All told, Doyle wrote fifty-six Sherlock Holmes stories and four novels. The Valley of Fear (1914) was the last. Among other works published early in Doyle’s career were Beyond the City (1892), a short novel of modern city life; The Great Shadow (1892), a historical novel of the Napoleonic period; The Refugees (1893), a historical novel about French Huguenots; and The Stark Munro Letters (1894), an autobiographical (having to do with one’s life) novel. In 1896 he issued one of his best-known historical novels, Rodney Stone, which was followed by another historical novel, Uncle Bernac (1897); a collection of poems, Songs of Action (1898); and two less popular novels, The Tragedy of Korosko (1898) and A Duet (1899). In 1900, his non-fiction book on the Boer War, ‘The Great Boer War’ was published. After two years, he published a ‘Sherlock Holmes’ series novel titled, ‘The Hound of the Baskervilles’. In 1905, he came out with a series of 13 ‘Sherlock Holmes’ stories titled, ‘The Return of Sherlock Holmes’. In this collection, the character ‘Sherlock Holmes’ reappeared after many years. In 1906, his historical novel, ‘Sir Nigel’ was published. The book was about the early period of the Hundred Years’ War. The following year, his book, ‘Through The Magic Door’ was published. He also authored nine other novels, and later in his career (1912–29) five narratives, two of novel length, featuring the irascible scientist Professor Challenger. The Challenger stories include what is probably his best-known work after the Holmes oeuvre, The Lost World. His historical novels include Sir Nigel and its follow-up The White Company, set in the Middle Ages. He was a prolific author of short stories, including two collections set in Napoleonic times featuring the French character Brigadier Gerard. After the outbreak of World War I (1914–18; a war between the German-led Central Powers and the Allies: France, England, Italy, the United States, and other nations), Doyle organized the Civilian National Reserve against the threat of German invasion. In 1916 he published A Visit to Three Fronts and in 1918 again toured the front lines. These tours, plus extensive communication with a number of officers, enabled him to write his famous account The British Campaigns in France and Flanders, published in six volumes (1916–1919). 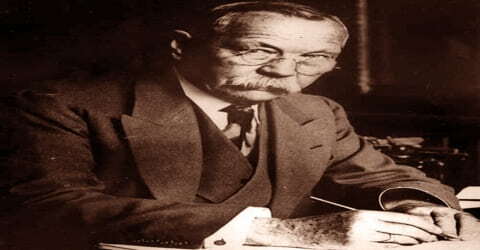 Conan Doyle himself viewed his most important efforts to be his campaign in support of spiritualism, the religion and psychic research subject based upon the belief that spirits of the departed continued to exist in the hereafter and can be contacted by those still living. He donated the majority of his literary efforts and profits later in his life to this campaign, beginning with The New Revelation (1918) and The Vital Message (1919). He later chronicled his travels in supporting the spiritualist cause in The Wanderings of a Spiritualist (1921), Our American Adventure (1923), Our Second American Adventure (1924), and Our African Winter (1929). He discussed other spiritualist issues in his Case for Spirit Photography (1922), Pheneas Speaks (1927), and a two-volume The History of Spiritualism (1926). In 1928, Doyle authored the ‘Professor Challenger’ short story titled, ‘When the World Screamed’. The following year another ‘Professor Challenger’ short story, ‘The Disintegration Machine’ was published in Stand Magazine. In his honor, a statue of him is built in Crowborough, where he resided for almost 23 years. There is a statue of Sherlock Holmes in Picardy Place, Edinburgh, close to the house where Doyle was born. Conan Doyle died of a heart attack at the age of 71, on July 6, 1930, of a heart attack, at Windlesham, his home in Crowborough, Sussex. His last words were directed toward his wife: “You are wonderful.” At the time of his death, there was some controversy concerning his burial place, as he was avowedly not a Christian, considering himself a Spiritualist. He was first buried on 11 July 1930 in Windlesham rose garden. At his funeral, his family and members of the spiritualist community celebrated rather than mourned the occasion of his passing beyond the veil. On July 13, 1930, thousands of people filled London’s Royal Albert Hall for a séance during which Estelle Roberts, the spiritualist medium, claimed to have contacted Sir Arthur. He was later reinterred together with his wife in Minstead churchyard in the New Forest, Hampshire. Carved wooden tablets to his memory and to the memory of his wife, originally from the church at Minstead, are on display as part of a Sherlock Holmes exhibition at Portsmouth Museum. 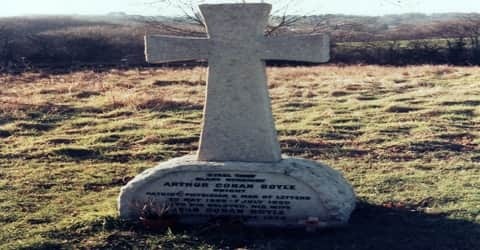 The epitaph on his gravestone in the churchyard reads, in part: “Steel true/Blade straight/Arthur Conan Doyle/Knight/Patriot, Physician, and man of letters”. He is the creative genius behind the popular fictional character ‘Sherlock Holmes’, based on whom he authored more than 60 detective stories. His notable work, ‘Stories of Sherlock Holmes’ is widely read, till date. In 1926, Doyle laid the foundation stone for a Spiritualist temple in Camden, London. Of the building’s total £600 construction costs, he provided £500. Conan Doyle detailed what he valued most in life in his autobiography, Memories, and Adventures (1924), and the importance that books held for him in Through the Magic Door (1907).